Driggs is located in the Teton Basin, alongside the Teton Mountains. It's on Idaho highway 33, about an hour from interstate highway I-15 and Idaho Falls. There is one stoplight on Main St. at the corner of Little Avenue. 5th St. is 5 blocks east on Little. 5th St. Park is 2 blocks south of Little, on the east side of 5th St. This is Phase 1 completed. Although this park is fairly small, it's been designed and built by skaters, with good quality and a lot of flow. The concrete slab with bowled corners is 3600 square feet in area, measuring 60 x 60 feet. The concrete is glassy smooth and the transitions are as good as any you'll find. The bowled corners have 2 1/4 inch round steel coping that's perfectly smooth and free of kinks, dents, or rough welds. The wooden construction of the ramps will permit easy changes to the park's design. All ramps are 3/4 ply forms with 2x4 or 2x6 joists on 6 inch centers, covered with 3/4 inch plywood (or 2 layers of 3/8), and skinned with 1/4 hardboard (masonite). All flat ramps have curved transitions at the bottom, and all ramps have 1/8 inch steel plates at the concrete. Coping is 2 1/4 inch round steel. The central funbox and ramps are modular to allow repositioning into other configurations. 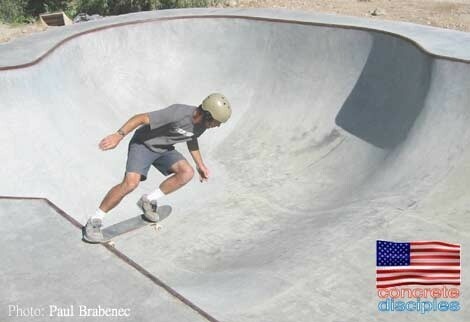 Phase 2 is a bowl to be built by the Dreamland Skatepark crew and scheduled for early summer '03! Meanwhile stop by and skate 5th Street!